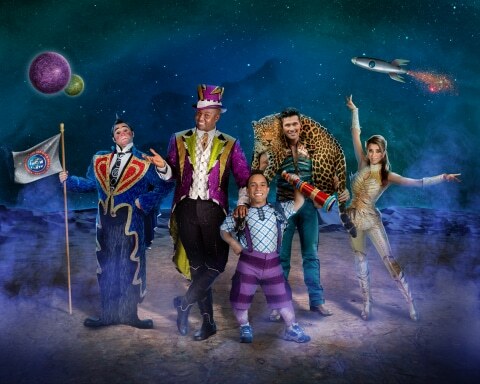 This July, Ringling Bros. and Barnum & Bailey® invites fans to blast off on an intergalactic adventure with the launch of Ringling Bros. and Barnum & Bailey Presents Out Of This WorldTM. The premiere for the first time on the West Coast at STAPLES Center in Los Angeles on Thursday, July 14, 2016. Tickets for all California stops, including Anaheim, Bakersfield, Fresno, Los Angeles, Oakland, Ontario, Sacramento and San Jose, are on sale now. Following the Los Angeles premiere, Ringling Bros. and Barnum & Bailey Presents Out Of This World will travel throughout the United States on a multiyear tour, including stops in Chicago, Miami and Atlanta. For a complete list of tour dates and locations through March 2017 and to purchase tickets, please visit the Ringling Bros. website (www.Ringling.com). Future tour dates will be announced at a later date. This entry was posted in Entertainment, For Teens, Videos and tagged circus, Ringling Brothers. Bookmark the permalink.